Every year I say I'm going to learn more about ufology and every year, I fall short. But, inspired by this goal once again, I bought Mack Maloney's UFOs in Wartime and surprisingly, made my way through it pretty quickly! 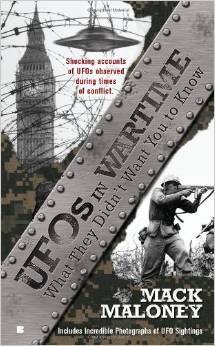 As the title would suggest, this book is all about UFOs that were seen during times of military conflict. A big chunk of the text is dedicated to World War II, the Korean Conflict, and the early days of the Cold War (most likely because this was the time period when modern warfare really took off and new weapons, especially nuclear, would have been a great interest to those keeping an eye on our planet), but a pretty good expanse of time is represented. Beginning in 312 when Constantine I were advancing toward Rome and ending with the 2003 invasion of Iraq, this book covers a lot of ground--understandably from the perspective of United States service men and women. At times, this book doesn't seem to go into enough detail, nor does it do an adequate job in quoting which sources were used for which pieces of information. However, this format works well for those new to ufology. A lot of information is covered in an easy to read and understand narrative that flows well and I've already marked a dozen or so snippets that I plan on researching further. Being basically a newbie, I was pleased that I was well aware of some of the cases presented in the book, most notably Roswell, the attack over Los Angeles, and Rendlesham Forest. There was also plenty that I had absolutely NO idea about though, and was thoroughly engaged. For example, one theory put forth states that even George Washington may have had a close encounter during the Revolutionary War! Less than 300 pages make up this mass market paperback, a handful of which are photographs and illustrations, so its a nice quick read. I do wish that some of those images were a little more...evidence based, though. So many photographs are referenced in the work, but do not actually appear in the work. But, its still a fun read and makes a nice little primer for such a broad topic.